Achilles rupture and Achilles tear can occur in accident cases ranging from automobile accidents to slip and fall cases, and more recently to prescription drug consumption (products liability). The sudden rupture of the Achilles must be treated with ice and rest. Often it feels like a massive kick to the back of the calve muscle. An MRI can confirm the rupture clearly, or a simple “Thompson test” can be performed by squeezing the calve muscle to see if the foot ambulates. An Achilles rupture usually does not occur in a car accident as the muscle pressures involved in brake pedal movement extend the calve muscle in a forward movement; this movement is the opposite of an extreme stretch of the Achilles and therefore is not a common injury experienced by car accident drivers. In unique cases, however, the Achilles can pop or tear in a car accident. Older clients are more prone to tear tendons in a slip and fall accident due to the condition of the tendon. Tendons loose their elasticity over time and begin to calcify, especially those who may have experienced tendinitis from running, tennis, or other activity. One who experience a slip and tear of the Achilles may injury the tendon from a stretch of the foot in the opposite direction, or a frontal fall where the foot maintains its position. A slippery substance causes the foot to move in one direction, and the other foot may be planted causing a tear. In July of 2008, the FDA began black box warnings on a group of antibiotics due to the recurring injuries of tendon and ligament tears. Cipro and Levaquin belong to a class of antibiotics called floroquinolones, which are sold under various brand names by different manufacturers. Cipro is made by Bayer and is usually used to treat urinary tract infections and other sexually transmitted diseases. The antibiotic became well known during the anthrax attacks in 2001 because it was one the drugs stored by the government for use in case of a terror attack. Cipro was approved by the FDA in 2000 to treat anthrax inhalation and in 2003 to treat urinary tract infections. Once a diagnosis has occurred, the repair options are two fold: surgery or non-surgical immobilization. Surgery is the most common treatment as it has the fastest recovery. The obvious concerns with surgery are infections and blood clots. Younger and active patients are pushed to have surgery. 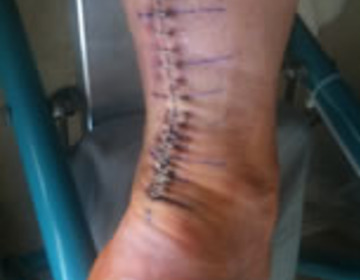 If surgery is performed, an incision is made in the upper heel and the tendon is surgically connected; the degree of the surgery depends on the severity of the rupture. Full ruptures get large incisions. To avoid risks, older patients may decide to be immobilized in a cast for up to 12 weeks. The option of surgery means and soft cast for two weeks post operation and three weeks of a hard cast followed by three weeks of a walking boot with a heel insert. Patients have options of doing physical therapy thereafter. If you have suffered an Achilles rupture or other tendon injury due to an accident, or by the consumption of Cipro or Levaquin, or by the negligence of someone else call the law firm of Benson and Bingham. We have experienced personal injury attorneys who understand medical conditions and accident related injuries. Rupturing or Snapping an Achilles has been Compared to the Pain of Child Birth.